Part of our teaching about self-regulation has been to help the children to understand the connection between what is happening in their brain, and the choices they make as a result of their emotions and how they are feeling. This has an impact on their learning as if the children are feeling stressed about a situation, they will not be able to focus their attention on classroom instruction for learning, refuel and rehydrate their bodies satisfactorily or even enjoy their social play. A few years ago our staff started using the Mind-Up Curriculum. We had a school-based Professional Development Day, and were provided with a day of excellent instruction, our own copy of the appropriate curriculum (Primary or Intermediate) and a Zenergy chime by our Principal at the time. Mind-Up has the children’s overall well-being at its core: when children are happy and thriving in their learning environment, they are better able to learn. We teach them how to focus their attention and to be more mindful of their words and actions. The children become aware of, and learn how to cope with stressors, their emotions and reactions and ultimately, enhance their ability to self-regulate so they are able to access learning. A better understanding of how the brain functions is necessary to put all of this into practise. Learning about and loving our brain has been some of the most fun and rewarding lessons we’ve ever taught. Our classes have always been fully aware of the importance of protecting their brains They reassure us with confidence that they wear helmets while cycling, skiing and snowboarding and scootering. Mind-Up has many teaching ideas, strategies and suggested books to read, but we choose those which we think are suitable for the class we have each year. We started with the first lesson on the three main parts of the brain: the pre-frontal cortex, the amygdala and the hippocampus. Mind-Up has an amazing poster that shows and describes each of these parts and their function. The Hippocampus is “the memory keeper”. 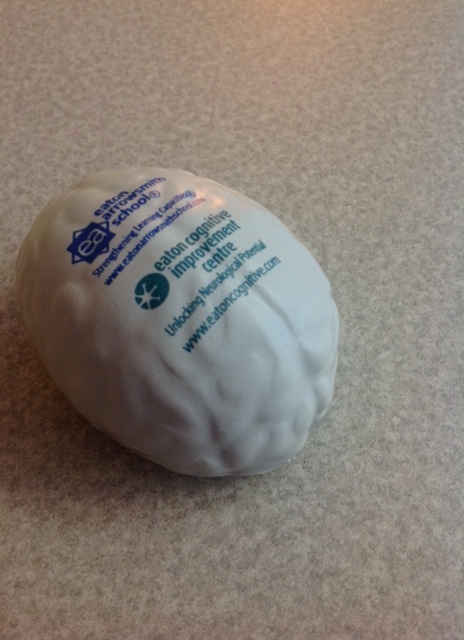 However, we’ve also had some really fun brain resources to use. One of the program’s DIY suggestions is to fill a bottle with sand, sparkles and water. When you give it a good shake, and everything mixes together, the children can see how the amygdala “works.” Sensory information is blocked (guarded) and cannot flow freely to the pre-frontal coretex, to make a good decision based on external stimuli. 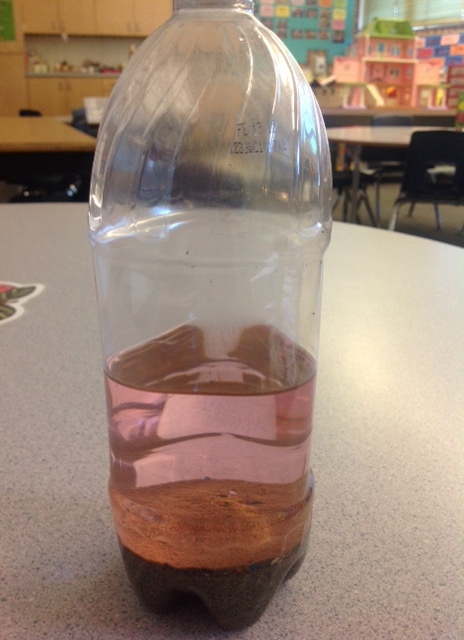 The children were fascinated with how long the bottle took to settle and for the water to be clear (the better part of the day). We also had a brain that our Principal Mrs. Brady gave me (we’re pretty sure there was no hidden meaning there) and another brain that Christy won at a district Pro-D workshop on self-regulation (sure, go ahead and laugh, Christy won a brain) to pass around so the children were able to see it’s beautiful silhouette. We asked them to squeeze it super hard three times to release some energy and it was wonderful to watch them practise a moment of self-regulation. Naturally, this has led to some very, very ridiculous brain jokes between us and the children. 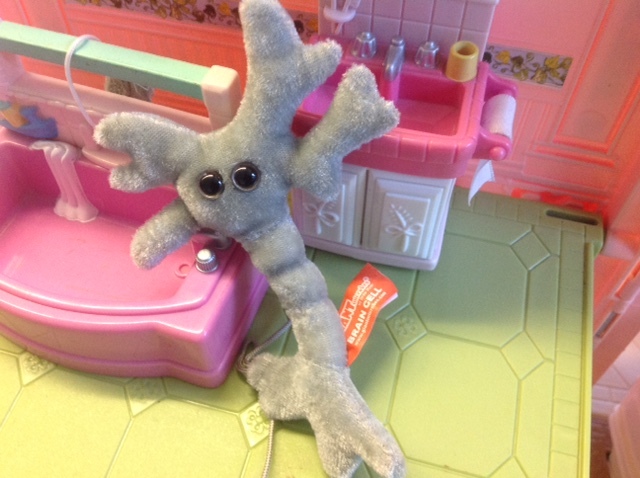 We’re very fortunate to have a brain cell, part of the swag my doctor brother-in-law received at a medical conference. Unfortunately, the size comparison to the brain cell (large) and the brain (small) made it fairly challenging when we tried to explain to the children that the brain was composed of many, many brain cells. The furry texture and big eyes of the brain cell raised more than a few questions. As we progress through the next few lessons, we will be teaching the children one of the most important components of Mind-Up, which is the Core Practise. The Core Practise is the use of the Zenergy chime and focusing all of our attention on a single note. Our children will be sitting calmly and cross-legged, palms facing up or down, eyes closed or open while looking at their lap. They will concentrate on the ringing of the chime, and then we will lead them through a deep breathing sequence. The Core Practise gives the children a self-regulation strategy to take a moment to focus and quiet the brain. When stressed, the amygdala will be in its security guard mode — not allowing sensory information to make its way to the pre-frontal cortex to make a rational decision. By teaching the children to be mindful of how they are feeling within their learning context, they can use a strategy to help themselves, or self-regulate, to calm down, and begin to feel relaxed, focused and ready to learn. The Core Practise is by no means the only strategy we will teach our Kindergarten students. We have already begun Calming Countdowns, and will continue to add more to our repertoire, so the children can make choices about what best suits their needs. Earlier this year we wrote about The Gift of Mindfulness. We hope it may bring some peace and calm to your day.